Last weekend I had the pleasure of guiding nine gentlemen around the Somme and Arras battlefield on bikes. 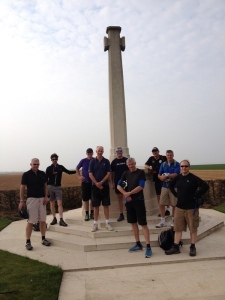 As a keen cyclist I try and take my bike when visiting the battlefields but this was something different in that it was the first organised specialist cycling trip I had put together. Our base was the delightfully comfortable Les clés des places in the heart of Arras. The Somme was our destination on Friday, leaving the neglected battlefields of Arras for the Saturday. Friday morning dawned with beautiful weather. 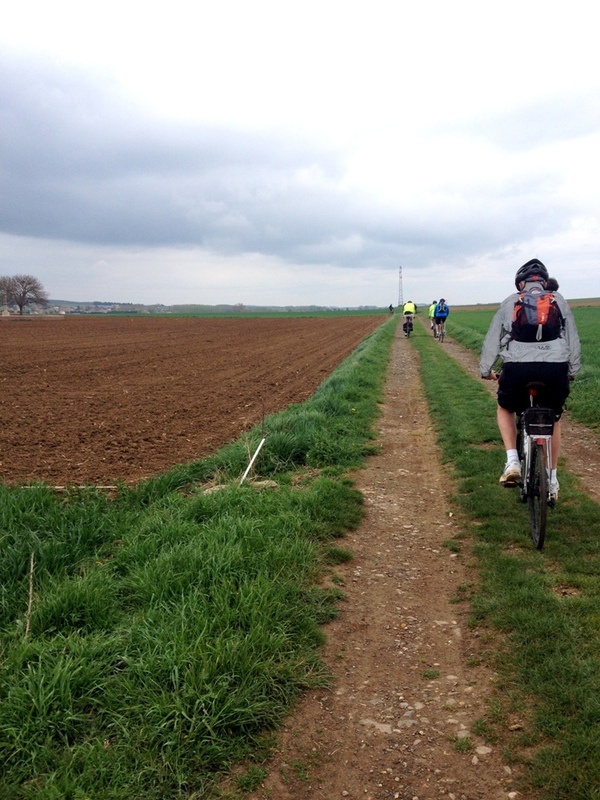 With the bikes fixed to the cars we headed south, crossing the ground voluntarily given up by the Germans as they pulled back to the Hindenburg Line in 1917. 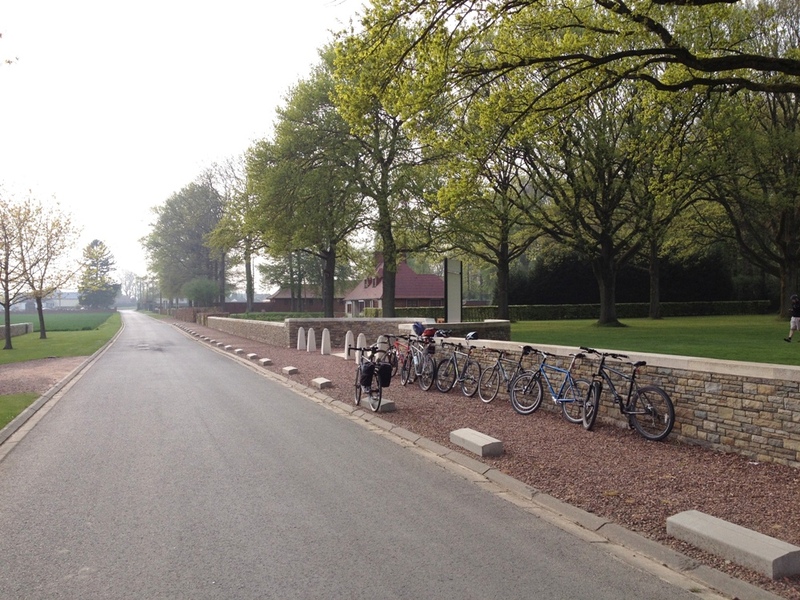 Parking at Serre Road Cemetery No.2, we got the bikes ready and headed off. 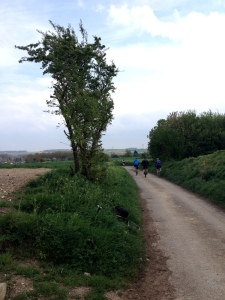 I had sent our proposed route to the group beforehand so everyone was aware of the distances involved. After an introduction of the battle and practices of the CWGC at Serre Road No. 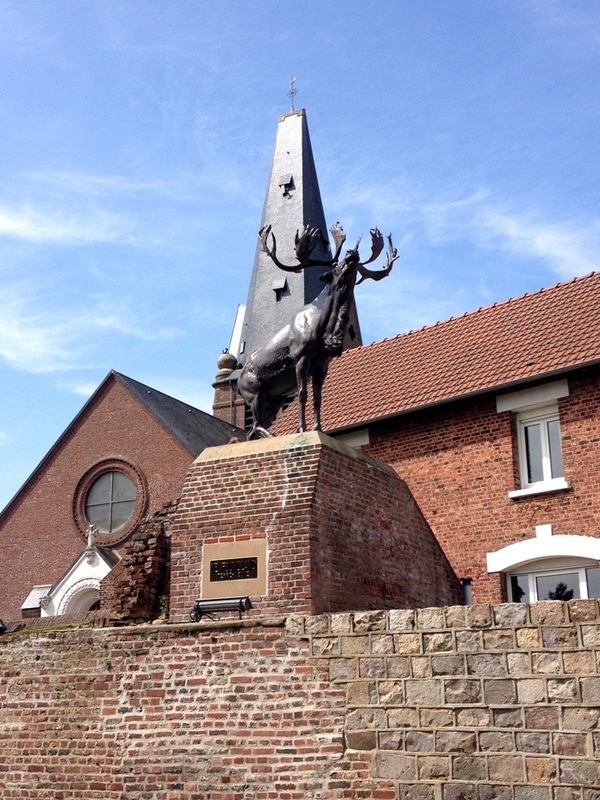 2 we headed across Redan Ridge with its isolated ribbon of battlefield cemeteries to the small village of Beaumont Hamel. As one of the Somme’s most well visited sites with a highly evocative story the Sunken Lane offered our first chance to get to grips with the actions of July and November 1916. After hearing a 1st Lancashire Fusiliers officer, Lt E.W. Sheppard’s description of the 1 July attack we rode via Auchonvillers to Newfoundland Memorial Park where we had a good walk around the trench system, visiting all three cemeteries. The descent to Hamel was fun; infinitely more so than the climb up the Mill Road to the Ulster Tower! One of the group had previously served in the Duke of Wellington’s Regiment so I was able to show him the Pope’s Nose and discuss the 1/5th Battalion’s attempt to capture the position in September 1916. After a visit to Lutyen’s imposing Thiepval Memorial and our first (and only) puncture of the day we headed via Mash Valley for lunch at the Old Blighty Tea Room in La Boisselle. 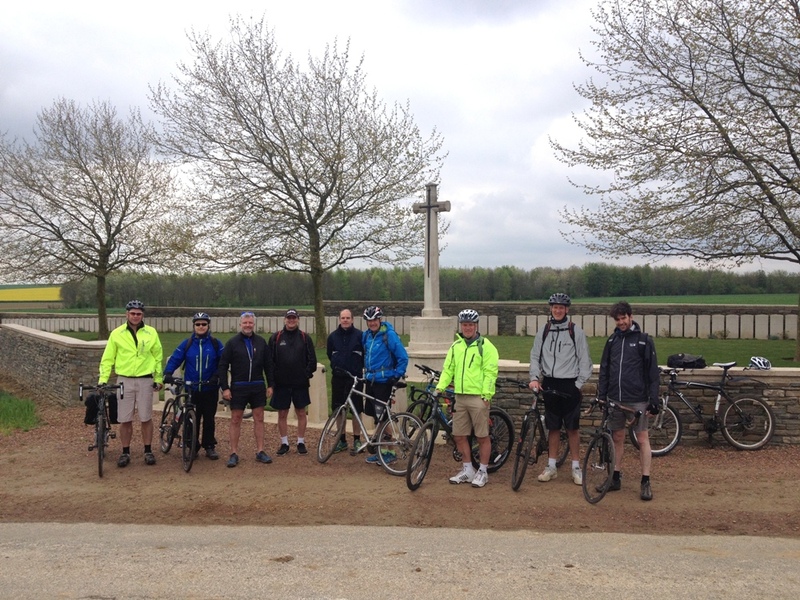 Subsequent stops included the Lochnagar mine crater, Becourt, Fricourt and Mametz. From the bottom of Dantzig Alley Cemetery we surveyed the undulating ground in front of us, a familiar view to the British in July 1916. Dominating the landscape is Mametz Wood, scene of so much heartache and horror for the 17th (Northern) and 38th (Welsh) Divisions. Our tour continued up to Montauban and Trônes Wood before a stop at Guillemont Road Cemetery where we paid our respects at the grave of Raymond Asquith, 3rd Grenadier Guards. Raymond, the son of the Prime Minister H. H. Asquith has been described as ‘one of the most intellectually distinguished young men of his day’. He had been mortally wounded at the start of the Guards’ attack on 15 September 1916 and died on his way to a dressing station. 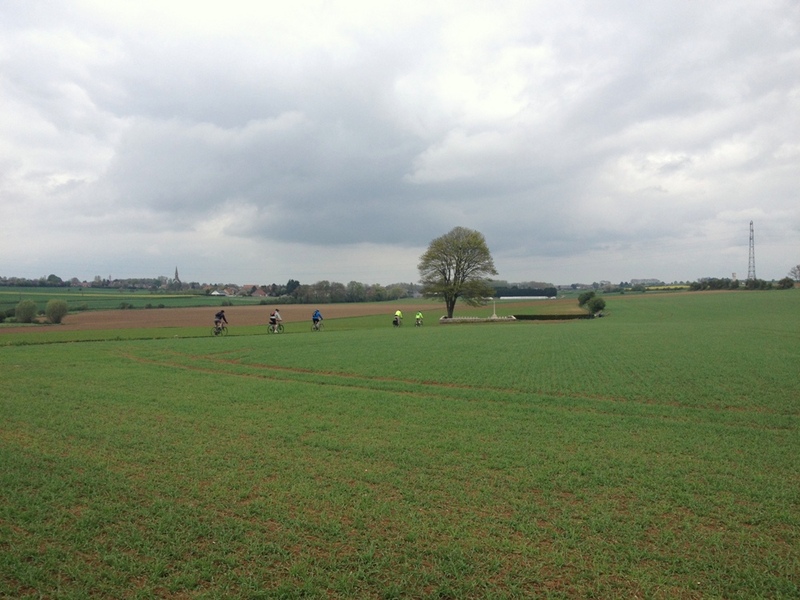 One of our group was a former Coldstream Guards officer and so we deviated from the original plan, heading to the Guards Memorial between Ginchy and Lesboeufs. The exposed position on the ridge to Lesboeufs is in the centre of the ground over which the Division fought in the second half of September 1916. 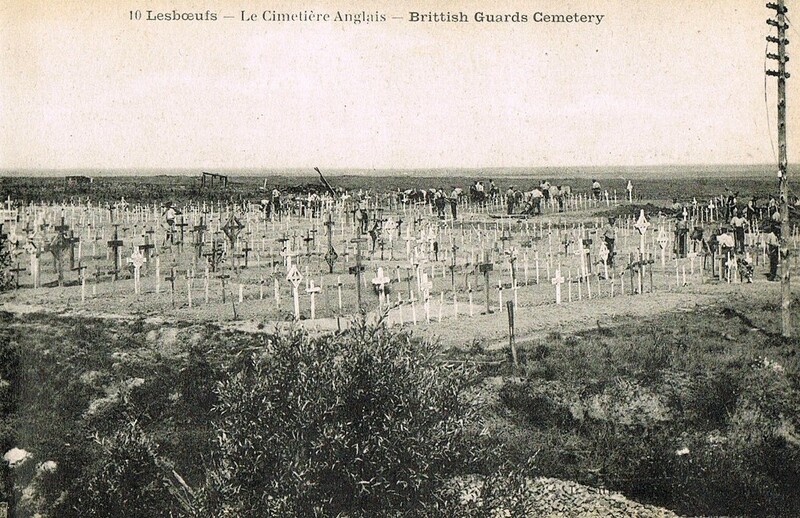 Postwar image of Guards Cemetery, Lesboeufs. The contrast between the haphazard crosses in this postcard and the neat rows of Portland headstones that greet the modern visitor is testament to the skill and dedication of the CWGC. 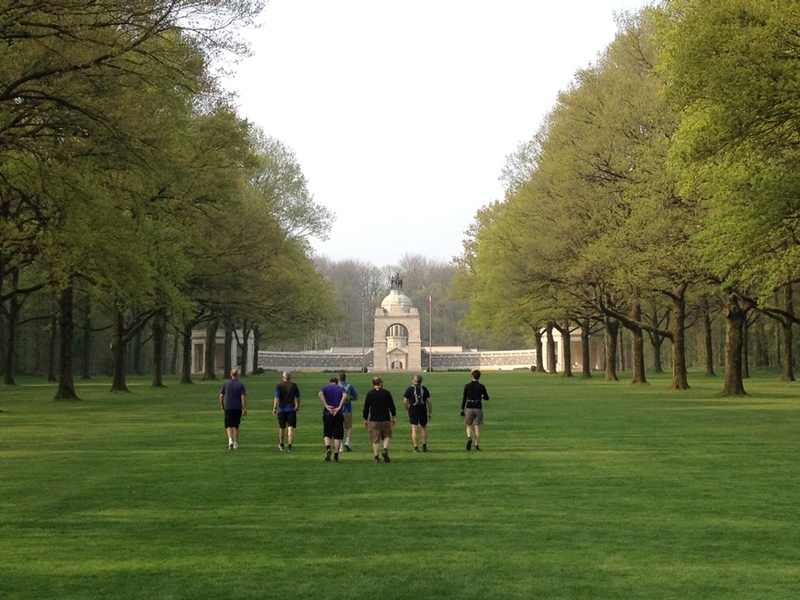 Our route back across the battlefield took in Delville Wood, looking a perfect picture of peace in dappled sunlight – the polar opposite of summer 1916. 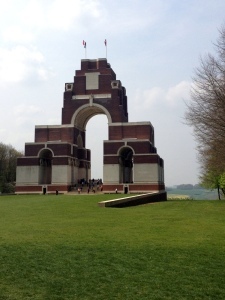 Away from Newfoundland Park and Thiepval the roads were quiet. Bikes lined up at Delville Wood. Next up was High Wood where I described the ferocious fighting that had raged there through the high summer of 1916. The wood and Switch Line proved such a bulwark to advance that British efforts resorted to siege warfare techniques; employing Vincent and Livens Large Gallery Flame Projectors in the wood along with the use of tunnellers to plant a mine under German positions. In the late afternoon light of a perfect spring day it was hard to imagine the carnage in these quiet mellow fields and woods. 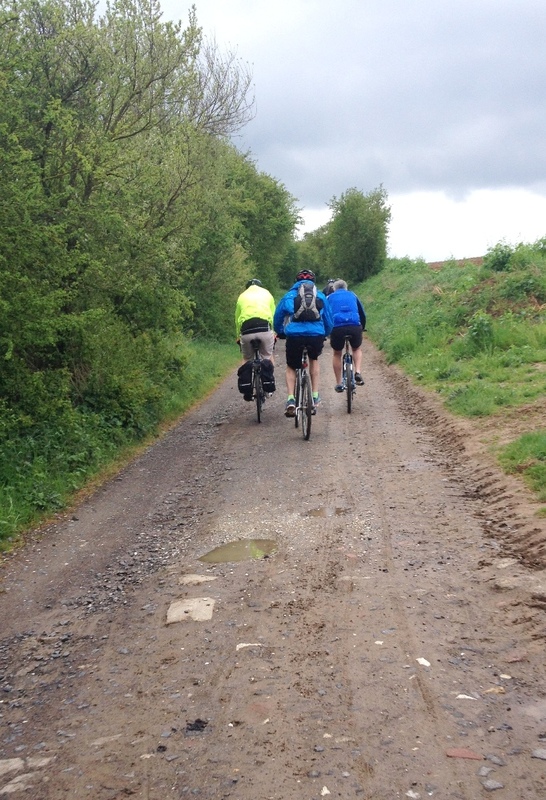 Crossing the Roman road we headed via Courcelette to Miraumont, along the Ancre valley to Beaucourt before a gentle climb up past Ten Tree Alley en route back to the cars. The conversations that night over a much-needed dinner and drinks all touched on the benefits of cycling in helping everyone’s appreciation of the battlefield. We awoke the next morning with slightly aching legs and for some, aching heads. There was no need for cars as we would be setting out directly from our hotel. Whilst the touristy spots of the Somme were packed with coaches and school groups the empty fields around Arras are a very different proposition. 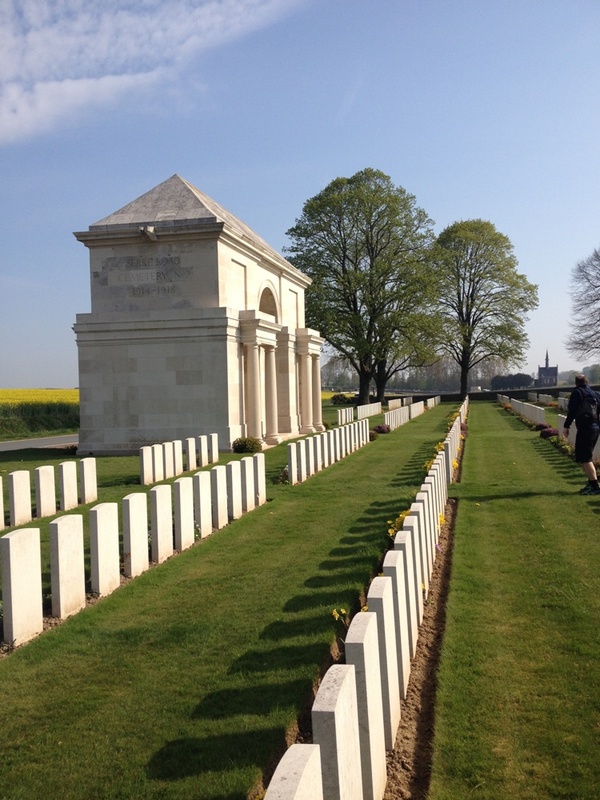 I assured our travellers that other than farmers and locals we would have the Arras battlefield to ourselves. Heading south via Beaurains (a bike path runs alongside the road for much of this) and London Cemetery we rode to Neuville-Vitasse, a village which in April 1917 was wired into the German defences with the main Hindenburg Line running just behind it. 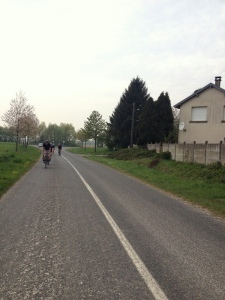 Heading up the bumpy track to Neuville-Vitasse Road Cemetery was fun. From its dominating position I spoke of the 30th Division’s attack on 9 April 1917, the start of the Arras battle. 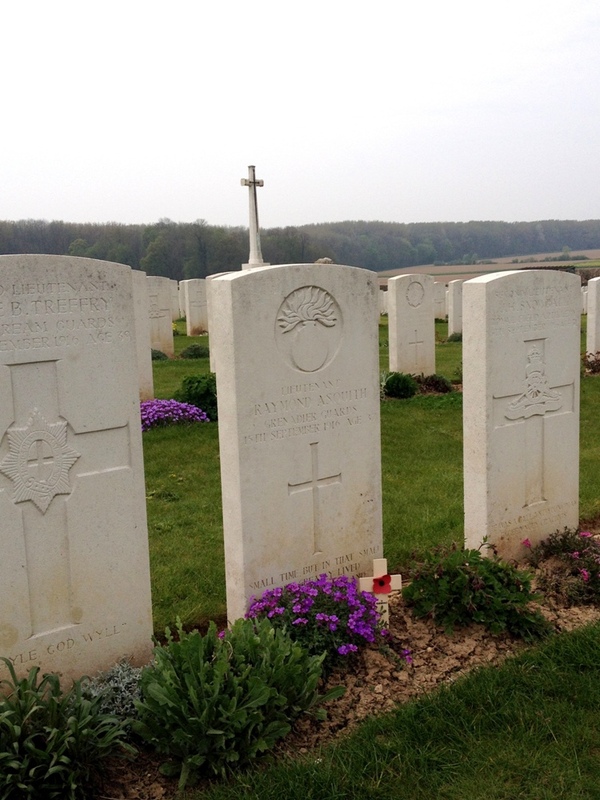 The closely packed graves of the cemetery are predominantly made up of men from the 2nd Wiltshires and 18th King’s (Liverpool Regiment) who suffered grievous losses attacking across this ground. 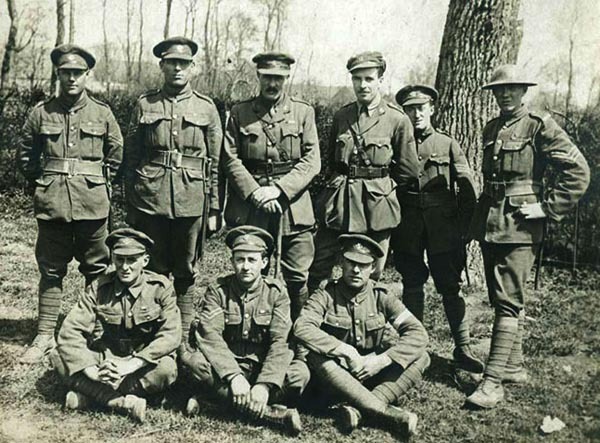 I explained the connection with Hugh Dennis’s grandfather, Godfrey Hinnels, whom I had researched for the television programme, ‘Who Do You Think You Are?’ Godfrey’s unit, the 1/4th Suffolk Regiment were tasked with salvage and burial duties in the days after the main attack. As such, it was likely he had been involved with the burial of the men that now lay in the cemetery’s walls. Next up was Cojeul British Cemetery which is the resting place, amongst others, for two Victoria Cross recipients – Horace Waller, 10th KOYLI and Arthur Henderson, 2nd Argyll & Sutherland Highlanders. Bikes could only get us so far. Walking the last bit to Cuckoo Passage Cemetery. Climbing Henin Hill we visited the remaining German pillbox (MEBU) before our next stop, the isolated and beautiful Cuckoo Passage Cemetery. 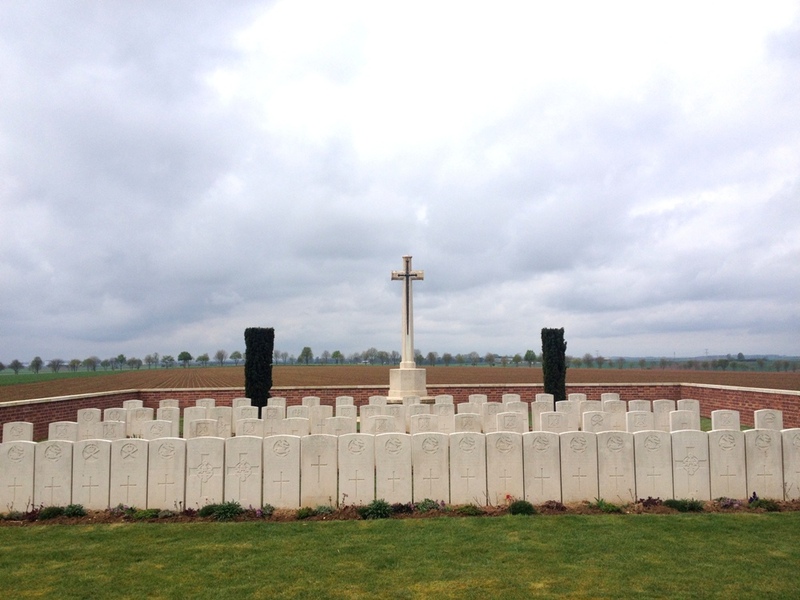 This small battlefield cemetery, full of Manchester Regiment killed on 23 April 1917 lies at the limit of the Manchesters’ advance. I read aloud an account by Private Paddy Kennedy who served with the 18th Battalion describing events that day. Many of his comrades lay around us within the cemetery walls. We returned back towards Heninel before picking the road up to Chérisy where I discussed the terrible events of 3 May 1917, the Third Battle of the Scarpe. 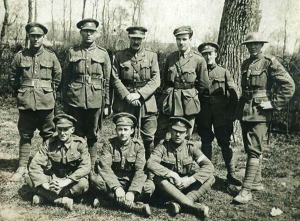 Described by Cyril Falls in the Official History as ‘a melancholy episode’ the attack that day was an unmitigated disaster for the attacking British forces. British dead for the day reached nearly 6,000 for very little material gain. Travelling by bike is by far the best way to appreciate the landscape; you feel every rise, every dip, every change in gradient. What would be a simple drive in a car takes on more meaning when on two wheels. Your thoughts turn irrevocably to the men whose footsteps still echo through the ground as, stealing a line from Sassoon, ‘they slogged up to Arras with rifle and pack’. 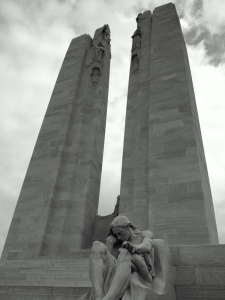 Continuing towards Hendecourt our focus changed for a short time as I described the Canadian successes of August and September 1918. 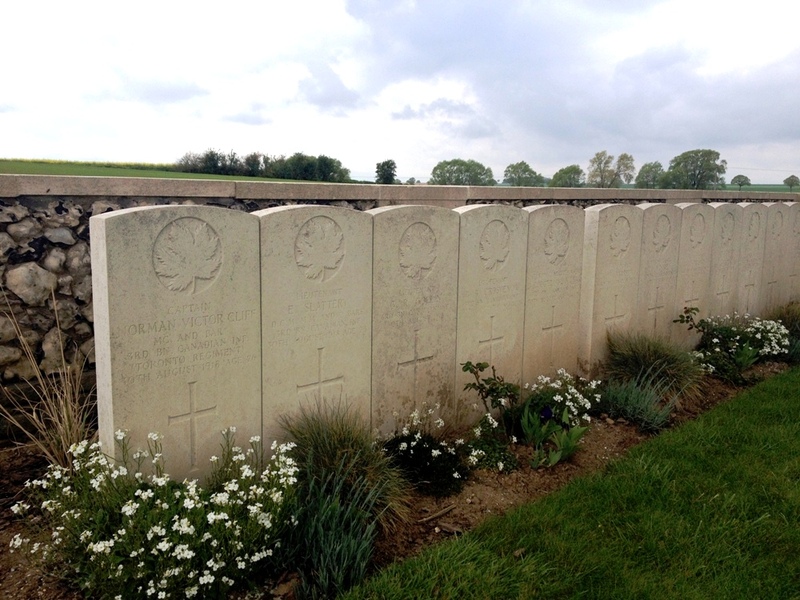 Stopping at Sun Valley Cemetery I pointed out the formidable obstacles of Upton Wood and The Crow’s Nest (the latter captured with great daring by the 15th Battalion (48th Highlanders of Canada) on the morning of 1 September 1918). Passing Quebec Cemetery we dropped down for our picnic lunch at the idyllic Valley Cemetery between Vis-en-Artois and Chérisy. This spot is the final resting place of a number of highly decorated officers and NCOs of the 3rd Battalion, Canadian Infantry who were killed nearby at the end of August 1918. 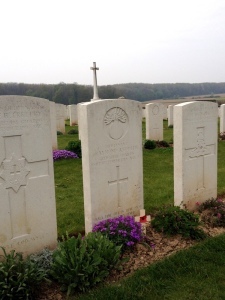 Amongst the 3rd Battalion men buried here is the 23 year old Lieutenant Edward Slattery, DCM, MM & 2 Bars. From the decorations received whilst serving in the ranks and his tender age he appears to have been quite some soldier. Our lunch stop. Picnic at Valley Cemetery, Vis-en-Artois. 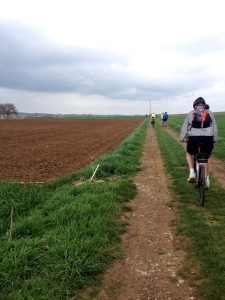 Suitably refreshed we headed back towards Guémappe and across the Route National towards Monchy-le-Preux. The road was blocked in the village, the result of a recent building collapse. 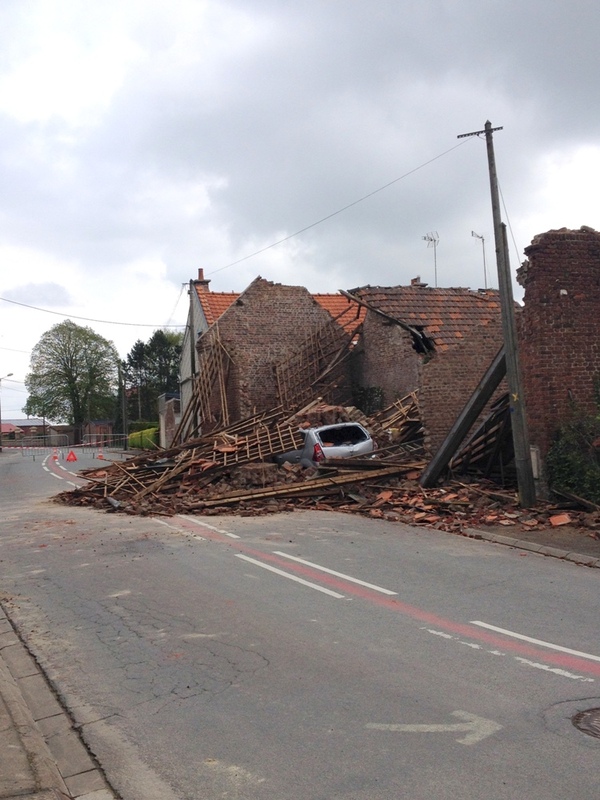 Undeterred, we headed west where I explained about the village’s capture and the terrible loss of British cavalry in its narrow streets on 11 April 1917. 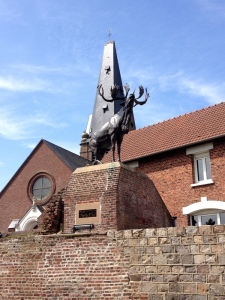 Having visited the impressive 37th English Division memorial and the Newfoundland Caribou in the village we rode eastwards, up Infantry Hill where I was able to regale the party with the story of the ‘Men who saved Monchy’: the disastrous 14 April 1917 assault by the Newfoundlanders and 1st Essex Regiment. Infantry Hill is a special spot for me, the scene of so much concentrated fighting and yet, like so much of the Arras battlefield, it remains rarely visited. It was in these fields on 3 May 1917, that disastrous date for the British Army, that one of our group’s great uncles, Private Thomas Clark, 8th East Yorkshire Regiment was killed. Standing close to the spot where the 8th East Yorkshires went over the top I was able to explain the actions that day, reading from the war diary to enable everyone to appreciate the disaster that befell the attacking British troops and the magnificent defensive performance of the German forces. The Battalion moved forward at Zero hour [3.45am] but owing to the heavy smoke combined with the darkness they found it difficult to move on any definite point or points. …The men were in good heart and moved forward readily. I attribute the results to the heavy smoke, combined with the darkness which prevented people locating their points of direction. In addition to this the enemy barrage was very heavy to which must be added the very effective use of machine-gun both from the front but also enfilading attacking troops. After some time to contemplate we returned to the village before riding down the Scarpe Valley to Fampoux where we looked at its capture on 9 April 1917 by the 2nd Duke of Wellington’s Regiment. Next up was another special spot; the Seaforth Highlanders cross overlooking the Hyderabad Redoubt, Greenland Hill and Roeux. Whilst there I explained the disastrous 11 April 1917 attack and read aloud the wonderful description left by Seaforth Highlander Private James Stout of events that day. It is a great shame there is nothing at the former site of the Chemical Works, so bitterly fought over during the battle to show the ferocity of fighting and losses sustained to secure its possession. The site is now a Carrefour mini supermarket where we bought a cool drink and snacks before our ride via Athies back into Arras. 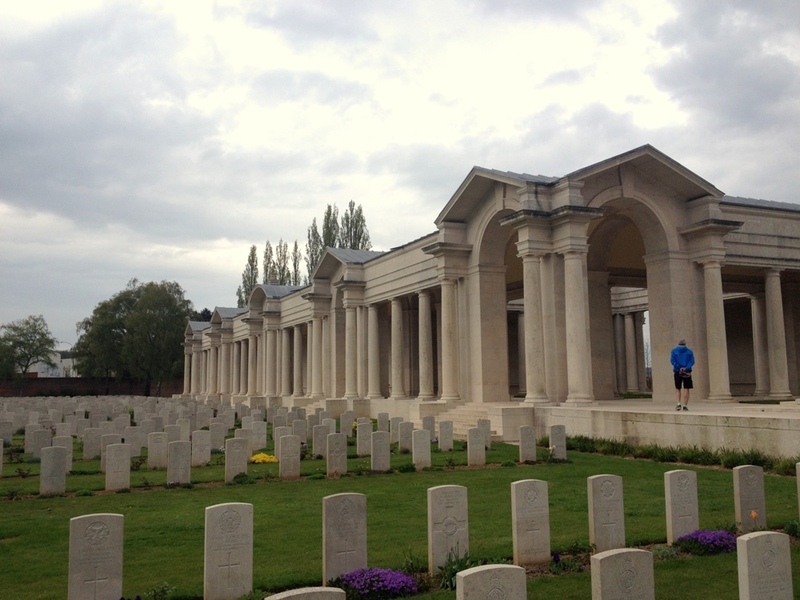 Our final stop of the day was the Arras Memorial where Private Thomas Clark and a further 34,765 men are commemorated. 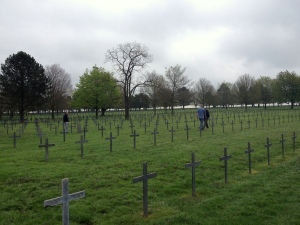 One of the group found the grave of his great uncle in the adjoining Faubourg D’amiens Cemetery. Tired but satisfied at the ground we had covered we headed back to the hotel before a good evening meal and much chat. Our final day was overcast and rainy. Bikes were attached to cars before we visited the huge German cemetery at Neuville St-Vaast and French cemetery at La Targette. Next up was the preserved battlefield on Vimy Ridge before our final stop at Walter Allward’s masterpiece, the Vimy Memorial atop Hill 145. My thanks to the wonderful group who I accompanied and for their generosity and looking after me so well. If you are interested in a battlefield tour by bike, either as a group or by yourself then please get in touch via the Contact Page. I would be happy to put an itinerary together for any British battlefield and am happy to cycle up to 50 miles/day. However, there is so much to see that 25-40 miles/day is the ideal distance.